No Man’s Sky is a game set in a universe with over 18 quintillion planets. But a number that big is pretty hard to wrap a human head around. comparing things in our universe, to the universe found in the game. We talked in terms specific to each of PlayStation’s channels. Our banners were custom made for the sites they were placed on. Our trailer got fans hyped for all of the planets waiting to be discovered in No Man’s Sky. But we didn't stop at planets. On PlayStation’s social pages we posted GIFs showing all the ways you could craft a ship in the game. Our weather reports brought the reality of this game’s diverse environments to the familiarity of your phone’s weather app. 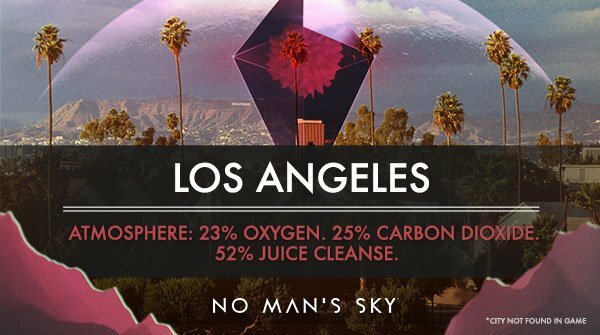 We even brought the game down to earth, with geo-targeted posts specific to real US cities.